Facility owners must assure safe work practices when hiring third-party contractors for electrical work (NFPA 70E Section 110). De-energizing equipment does not absolve the facility from the responsibility of performing an arc ﬂash analysis or providing the necessary personal protective equipment (PPE). OSHA and NFPA have rules that prohibit energized work. To establish that a circuit is de-energized, the circuit must be approached to verify that it has been de-energized. Until then, the circuit must be considered energized per NFPA 70E and the worker who performs the veriﬁcation test must wear full PPE. 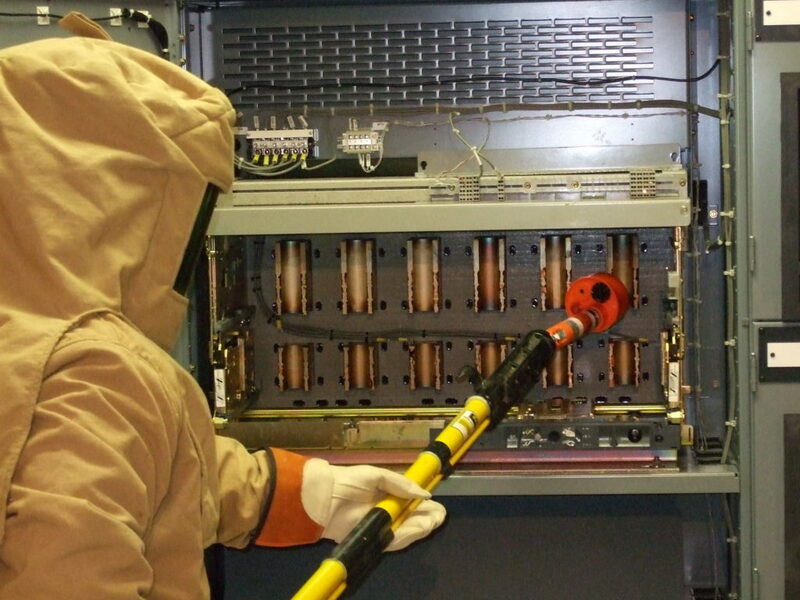 The following arc ﬂash mitigation solutions remove a worker from the location of, or place a barrier between the workers and exposed energized parts. Infrared Viewing Windows – Having infrared (IR) windows permanently installed into electrical equipment enables IR scans to be performed without exposing the worker to hazardous energy. IR windows are made of a glass-like material that is transparent to infrared rays and allows hot spots to be registered by a thermographic camera. They also facilitate permanent access for inspection of electrical components without disturbing operations. Online Temperature Monitoring – Online temperature monitoring, via wireless sensors, provides continual access to critical connection points where traditional thermography cannot be used. This technology evaluates the equipment’s current condition without exposing workers to energized parts since equipment covers do not have to be removed. The sensors are installed during a planned outage and can be used in equipment with high arc ﬂash ratings without a risk of danger to personnel or equipment. Remote Racking System – A remote racking system (RRS) allows circuit breaker racking operations to be performed via a control panel located away from the cell, removing the operator from manual contact with the circuit breaker. If the operator controlling the RRS is located outside the arc ﬂash boundary, the need for PPE is eliminated. Electrical hazards are a signiﬁcant safety and ﬁnancial risk for electrical workers and their employers. OSHA mandates that work on electrical equipment must be performed in a manner that does not expose the worker to undue risk of injury. Complying with the safe work practices dictated by NFPA 70E and implementing arc ﬂash mitigation strategies through engineering controls will enhance workplace safety for employees and reduce the ﬁnancial risk for your company. Contact us for more information on strategies to lower your risk for an arc flash event.